Police have reported an explosion in a kindergarten in eastern China, which they are now investigating. An explosion at a kindergarten in eastern China on Thursday killed at least seven people and injured dozens of others, authorities said, as state media published images showing bloodied and unconscious victims. Images circulating online showed that the force of the blast tore people's clothes off and one woman was seen clutching her child, who is in tears. 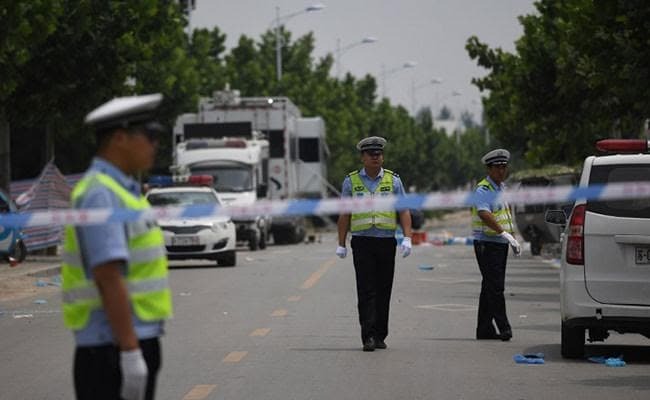 Xinhua news agency, citing the emergency office of Xuzhou city, said the explosion happened at the gate just as children were leaving the school in the afternoon. An official at the police station in Fengxian county told AFP that the cause of the blast was under investigation. However the Global Times and China Youth Daily newspapers cited witnesses as saying that a gas cylinder at a food stall had exploded. At least seven people were killed and 66 injured, including nine seriously, according to Xuzhou city government. Two died at the site of the explosion and five while being treated. Pictures of the scene showed more than a dozen people outside a building, many lying on the concrete and some appearing to be unconscious, including a small child. Another video posted by the People's Daily shows emergency workers arriving at the scene with gurneys. Another shows people lying in a hospital. Online media reports cite a business owner near the kindergarten as saying that around 5:00 pm (0900 GMT) he heard a "bang", and found that there had been an explosion at the kindergarten entrance only 100 metres away. There have also been knife attacks at schools in recent years. In January a man armed with a kitchen knife stabbed and wounded 11 children at a kindergarten in southern Guangxi Zhuang autonomous region. In February last year, a knife-wielding assailant wounded 10 children in a schoolyard in Haikou, in the southern island province of Hainan, before committing suicide. In 2014 state media reported that a man stabbed three children and a teacher to death and wounded several others in a rampage at a primary school that refused to enrol his daughter. That followed a March 2013 incident in which a man killed two relatives and then slashed 11 people, including six children, outside a school in China's commercial hub Shanghai.